The country’s longest-serving female senator, Barbara Mikulski, is attending her last Democratic National Convention as a public official — and plans to go out with a bang. PHILADELPHIA — Known as a “little general in pearls,” a legendary Maryland lawmaker and just plain “Barb,” the country’s longest-serving female senator, Barbara Mikulski, is attending her last Democratic National Convention as a public official – and plans to go out with a bang. 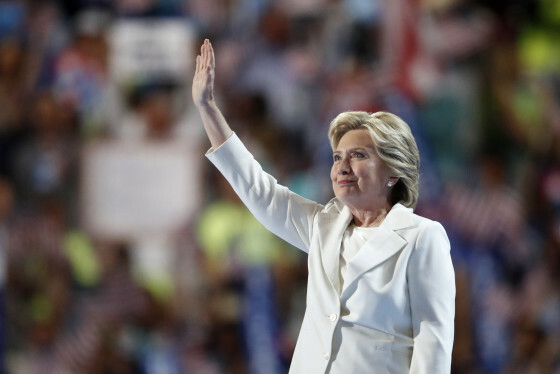 See photos from the 2016 Democratic National Convention held in Philadelphia, Pennsylvania. The small-statured politician formally nominated her friend and former Senate colleague Hillary Clinton for president on the Wells Fargo Center convention stage Tuesday, along with U.S. Rep. John Lewis of Georgia. The Baltimore born-and-raised senator, known for her fiery temper, is also scheduled to speak Thursday in support of Clinton as part of a program featuring Democratic women senators. 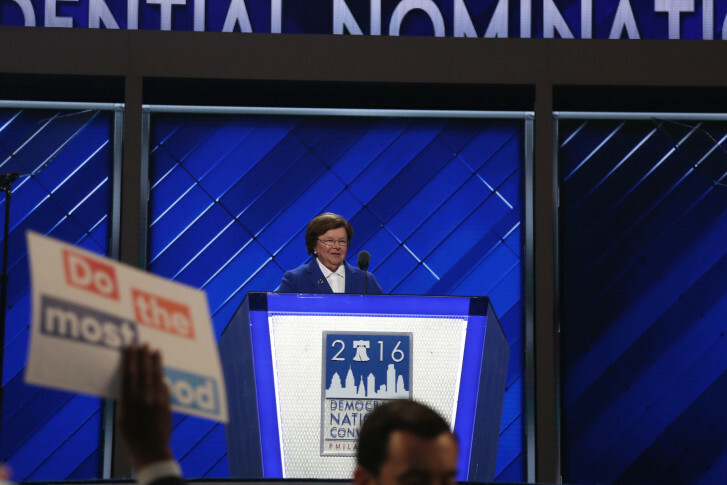 Mikulski supported Clinton in her 2008 bid, serving as the chair of her campaign, and played a central role in 2012’s party convention, speaking in support of President Barack Obama. “I can’t imagine it being anything other than a huge validation of Senator Mikulski’s career if Hillary Clinton is the next president of the United States, which I hope and expect her to be,” said Maryland Comptroller Peter Franchot in a phone interview. For Maryland Democratic delegate and state senator Susan Lee of Montgomery County, Mikulski has built a foundation for all female politicians, both in Maryland and nationally. The senator even endorsed Lee in her campaign for the Maryland House of Delegates. Lee, former executive director of the National Democratic Council of Asian and Pacific Americans, said that Mikulski “did all that she could to help” the organization and “understood” the challenges facing immigrants due to her personal history as the daughter of Polish immigrants. According to Lee and other Maryland politicians, Mikulski has always supported women “who had earned respect” and had a “strong track record” running for office, but did not just support them for being women. Referred to as the “dean of women” in the Senate, Mikulski has been known to host regular dinners and workshops for female senators in both parties. Her support for Clinton, then, only made sense. Mikulski dubbed her a “fellow trailblazer” in her 2007 endorsement speech. Supporting women outside of politics has been a focus for Mikulski as well – she has been at the forefront of fighting for women’s issues like healthcare and equal pay, along with creating legislation to help families and the elderly. Early on in her career, she fought against the dress code for women in the Senate, which originally limited women to dresses and skirts. She wrote the Spousal Anti-Impoverishment Act to help those burdened by nursing home costs, she worked on the Lilly Ledbetter Fair Pay Act for equal pay for women, and amended Obamacare to include mammograms and cervical cancer screenings for women. Mikulski also built a Baltimore legacy before claiming her Senate seat. She grew up in the Highlandtown neighborhood, obtained a bachelor’s degree in sociology from Mount Saint Agnes College (now part of Loyola University) and a master’s degree in social work from the University of Maryland. As a community activist, she was credited with helping to save East Baltimore from being torn apart by highway construction. Years later, in November, was Obama awarded her the nation’s highest civilian honor, the Presidential Medal of Freedom, he recalled that early battle in Baltimore. She won a Baltimore City Council seat in 1971 and served in that post for five years. She successfully ran in 1976 for the U.S. House of Representatives, where she served for 10 years before winning a Senate seat in 1986. During her extensive federal government career, she was not only known for her short stature and sassy nature but for also serving on prestigious committees, working her way up to become the first woman to chair the powerful Senate Appropriations Committee in 2012. After the Republicans took control of the Senate in 2014, she became vice chairwoman of the panel. With this year being her last term in the Senate, and this week in Philadelphia, her last convention as an elected official, many Marylanders agreed that they will miss Mikulski. For Cardin, the convention is sure to be an “emotional” and “exciting” one. Congressman and DNC delegate Van Hollen is favored in his race against Republican Kathy Szeliga to replace Mikulski in the Senate after she finishes out her final term. “My granddaughter, who is 8 weeks old – I’m delighted she’s going to get to be an infant during the administration of the first woman president of the United States. To me, that’s an inspirational message,” Franchot said. “Hillary Clinton is standing on the shoulders of individuals like Barbara Mikulski, and I’m sure she would say that,” he said. Capital News Service is a student-staffed news wire and broadcast news service operated by the University of Maryland’s Merrill College of Journalism. © 2016 Capital News Service. All Rights Reserved.